On a number of occasions Azam and Barbara have expressed a desire to become involved in assisting the parents of the Christian families in their city to value education more. The obvious place to start is to teach the adults to read and they receive constant requests from the adults, especially the men, desiring to learn to read. At the little church in Rawat, a group of three Christian families, there was not one man who could read. These are men in their teens and upwards. No one could read. Because of this they were all street sweepers, none of them could get any other type of employment. They were desperately poor. Some of the women could read and this further embarassesd the men. But, now they were determined to learn. The impact of this poverty was that they took their children out of school while still young to earn funds as it was the only alternative they felt they had to enable them to put enough food on the table. So, another generation of young people was growing up unable to read and with no appreciation of the value of education. Not one person from that Christian community has ever finished secondary school. For a number of years, Azam and Barbara have been concerned about the lack of education amongst the poor in Islamabad. Barbara has started a school and a number of training courses have been initiated to teach women how to sew. The sewing training has been very effective and most of those who have been trained are contributing to their family income. They and their families are very grateful for the training and the improvement in family life attributed to the extra funds. But the issue of adult illiteracy has been a major issue for a long time and one of the root causes of poverty in these communities. There are schools of course and they are largely free, but because education is not valued by the poor. Children, especially girls, are taken from school at a young age to contribute to family incomes and they never learn to read and write. This just adds to the problem of poverty. In 2009 BHW was asked to start an adult literacy class in Rawat as a pilot scheme. The Christian men in the community were desperate to learn to read and write and a building with desks and chairs was already being rented for the sewing programme. In 2011 it was decided to start this programme. The beneficiaries of this programme will be the adult men and women in Rawat who cannot read. The initial group will be the men and some women from the church and when the pilot has been finished, it will be opened to the whole community. This partnership comes from an expressed desire from the men to learn to read and write so they have a strong desire. There is good leadership with our experienced partners, Azam and Barbara Gill, Barbara is a school teacher and administrator. There is a qualified teacher available and good teaching materials as well. It will be quite easy to assess the progress of the trainees and monitor the changes that occur because of this programme. Azam has been in Christian ministry for more than 12 years and is very passionate about the Good News. He is married to Barbara and they have three children, two boys and one girl. 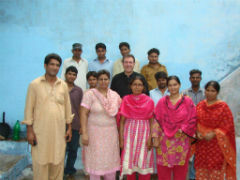 He became a follower of Jesus in 1987 and in 1991 joined Bible School in Pakistan. They are well known and have served the community for many years, especially in Rawalpindi and Islamabad. He has a heart for church planting and development and sees the benefit of providing training and education to the poor in his community. They both come from Christian backgrounds, Azam from Christian Brethren and Barbara from Baptist. They are passionate about seeing communities transformed by the power of the Good News and the presence of local churches. Barbara is a school teacher and is leading the development of the training and poverty reduction programmes. Azam is fearless in his proclamation of the gospel and travels around a lot preaching and training people. 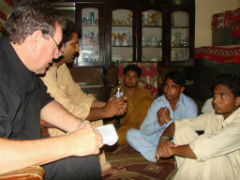 The vision is to develop a programme that teaches adults, particularly poor Christian adults, to learn to read and write so they can participate in Pakistani community, obtain decent jobs, earn a reasonable income and value education which will stop them taking their children out of school before they are educated. The participants will be taught to read and write in Urdu first and some in English as well. Each participant will pay the equivalent of around US$1.15 per month to attend the course. The annual budget for a group of approximately 20 students is $US3,259.